In America's heartland, ex-Army Colonel Nathaniel Cromwell and his eighteen year-old son farm eight hundred acres of corn and wheat. This year, as he has the last five, Cromwell sold ninety percent of his summer harvest cash advance in January to finance planting in the spring. Now in June, as the price of wheat breaks twelve dollars a bushel, Cromwell curses the day he must harvest his fields at four-twenty-six, because it will be the grain dealers and speculators, not the farmers, who will reap the profits of Asia's grain shortage. Cromwell awakens on the twenty-second of June to broad daylight at two a.m. A wall of fire stretches across the western horizon. His neighbor Tom Foster has torched twelve hundred acres of wheat in protest of the market mechanisms. It is the third field burning in two weeks. But this one is different. Foster stays in his fields after setting them aflame. Three days later, at Foster's funeral, the President of the National Grange approaches Cromwell. The farmers are trying to organize a strike. They need someone to provide leadership. Awarded a Medal of Honor in 2002 and dishonorably discharged in 2004 for speaking out against US military operations in the Central Asia, Cromwell is a man with national recognition to the masses and a rebel hero's spark among the farmers. He accepts the Grange's request to run the strike. AVAILABLE NOW from Mud City Press for $20 plus shipping or from Amazon.com for $22.00 or as a Kindle application for $3.99. PEAK MOMENT TV TALKS PRAIRIE FIRE WITH DAN ARMSTRONG: This is a great interview of Dan Armstrong by the Yuba Girls of Peak Moment TV. "Gripping, compelling; this is the populist novel of the twenty-first century! With the excitement of a James Bond thriller, this novel takes the reader from the wheat fields of Kansas to the bedrooms of those who own the international banking system, meanwhile involving the world's stock exchanges, the world commodities markets, various world mafias, secret government intelligence agencies, the money of the massive world narcotics trade, the well-known military-industrial complex, and, of course politics. While this novel is as fresh as the morning paper, you will not find it there. This is well informed deep background set against the objective fact of the rapidly diminishing world grain reserves, climate change and peak oil. Populated with strong characters, the touching story of love and intrigue will grip you to the end." -Willilam H. Kötke, author of The Final Empire. "The genius of Armstrong's storytelling is in his ability to create and clearly define the protectors of our common ground. You think you know who the good guys and bad guys are in real life? Armstrong has some surprises for you...The book is neither left nor right: it's about localizing the stewardship of the land and the commitment that may be necessary in order to do so." Lanny Cotler, California Grange Newsleter. "PRAIRIE FIRE is more than a totally engaging story that captivates the reader as if it were a Dan Brown suspense adventure. It reflects careful research and analysis of a modern-day systemic problem in the global food system, and provides a strong political statement that questions the organization of our most important industry as well as our basic values." Charles Francis, Journal of North American Colleges and Teachers of Agriculture. "A complex, sharply written, melodramatic suspense yarn that manages to be at once as entertaining as any kind of Jason Bourne/Ethan Hunt adventure and as serious a treatment of today's issues as an expos� by Upton Sinclair," writes Frank Kaminski in his review for The Energy Bulletin. 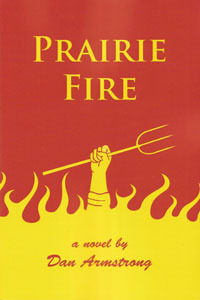 "After a few chapters I was fully drawn into the drama and detailed fabric of PRAIRIE FIRE. Dan Armstrong has the descriptive and dramatic voice of a skilled novelist combined with the disciplined attention to detail of a street beat journalist. The characters are engaging, the background is fully realized, and the energy of the story keeps a reader turning pages. "-Michael Richards, author of Sustainable Operating Systems: The Post-Petrol Paradigm. "Just finished PRAIRIE FIRE last night! Congratulations on your excellent piece. The scope was comprehensive and very timely. You developed excellent credible characters and weaved their stories well. I especially liked the populist uprising angle and its hopeful vision. I will heartily recommend your book to my circle of people." -Viktor Stathakis, Board of Directors Wayne Morse Youth Program. Journal of North American Colleges and Teachers of Agriculture, Prairie Fire Newspaper, Lincoln, Nebraska; Frank Kaminski; California Grange Newsleter; Kit Bradley; Oness Press. AVAILABLE NOW from Mud City Press for $20.00 plus shipping or from Amazon.com for $22.00 or as a Kindle application for $3.99. Also available in Eugene at BLACK SUN BOOKS, 2467 Hilyard and THE KIVA, 125 West 11th.